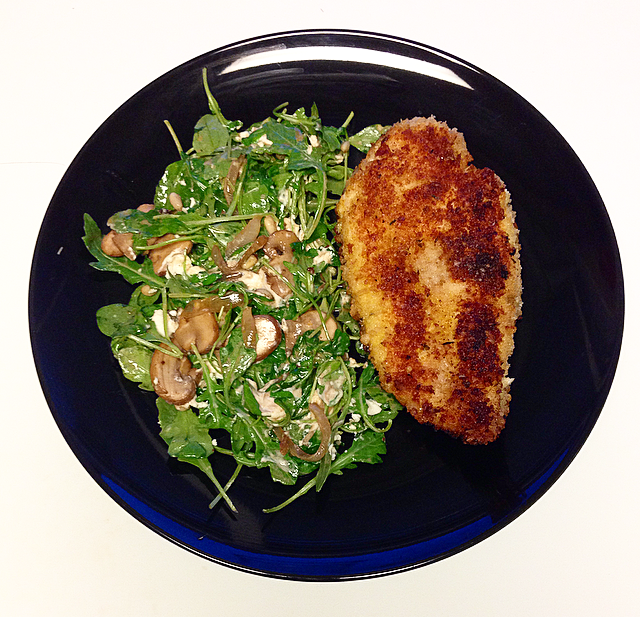 Not Your Everyday Salad: Warm Mushroom Arugula Salad with Panko Fried Chicken – Pao Says, "Open Wide!" Again, chicken does not run scarce in my freezer, so let’s try it fried. To balance that out, I’ll make the rest of the meal healthy- salad, of course. In a pan, heat up some olive oil. I used a little less than a 1/4 cup (this is the base to your dressing). Toss in the onions or shallots and cool until translucent. Add the mushrooms and toasted pine nuts, as well as a pinch of salt. Once the mushrooms are coated in the oil and beginning to soften and cool, add about 3 tbsp balsamic vinegar and a splash of white wine. Let this reduce over medium heat for a minute or two. This is your dressing! Pour it over the arugula and toss your salad. Finish it off by topping it with crumbled goat cheese (I happened to have fig goat cheese and it was bomb- I feel that honey goat cheese would also be delish). You now have a next-level salad. The chicken was simple, too! I seasoned the chicken breasts with garlic salt, dipped them in flour, then eggs, then seasoned Panko bread crumbs, and set them aside for a few minutes (while chopped everything for the salad).